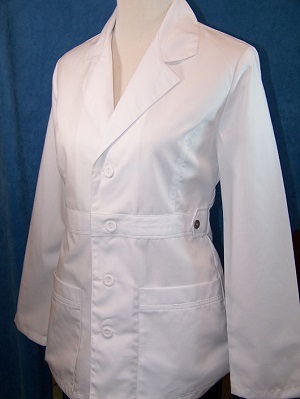 This contemporary trim fit jacket has princess seams front and back and features a 1 1/2" wide sewn down belt front and back. It has two lower pockets and a side decorative belt & tab with metal buttons. Shown with white matte buttons. Available in XS, S, M, L, & XL. See size chart below.